Our professional team of florists considered the importance of tradition and sophistication when selecting the flowers for this bouquet. With elements of green and red, we have created a warm and welcoming hatbox perfect for anyone this Christmas. 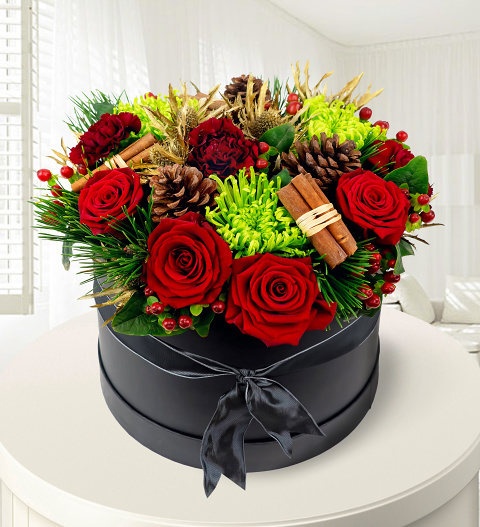 Included in this fine selection of festive flowers, you will find Grand Prix Roses, burgundy Carnations, pinus, hypericum, thistle, pine cones, cinnamon sticks for the perfect finishing touch. This bouquet comes arranged in a lovely hat box which adds to its elegant appeal.